Fez players be forewarned, the following contains spoilers. 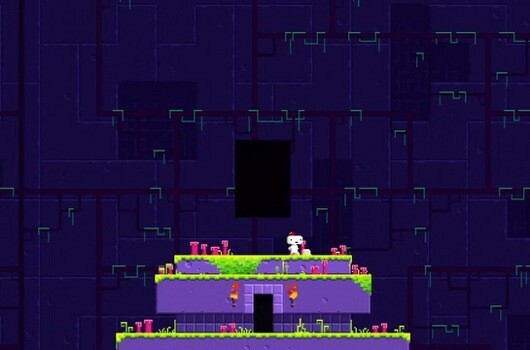 Stay far, far away if you want to uncover all of Fez's secrets for yourself. With that out of the way, dedicated fans know that collecting cubes is only half of Fez. The other half is solving puzzles, some of which hide their solutions in plain sight, while others taunt players with obtuse, seemingly indecipherable clues. All of them, however, operate on some degree of logic and conform to a certain set of rules. All of them, that is, except for one, which seemingly defies Fez's already convoluted systems. If you've struggled with it yourself, you already know which puzzle we're referring to: the monolith. Or, as you may have come to know it, that effing monolith. Unlocking the monolith, and thus obtaining one of Fez's three mysterious red cube artifacts, requires a specific combination of button inputs. The monolith appears after inputting a code found on one of the in-game treasure maps, half of which has been burned away. Presumably, the code needed to actually unlock the monolith would have been printed on the missing half of the map. It's the ultimate tease, giving players half the answer, with the real answer seemingly a complete mystery. Only days since Fez's release, the solution to the monolith has been found, though not via an epiphany or in-game discovery.The online Fez community came together to solve the puzzle via "brute force," with members of the community literally trying every conceivable button combination. Of course, the actual solution isn't nearly as interesting as the road that lead to its discovery. Ars Technica has published a piece detailing the days of maddening effort put forth by many members of the Fez community, from deciphering the game's cryptic alphabet to translating its artifacts and even opening a website to help crowdsource the effort to crack the code. If you've struggled through Fez's more obscure puzzles – or abandoned them in frustration – the story is fascinating stuff. Incidentally, while the solution to the monolith is now known, the logic behind it – if there is any – remains a mystery. Like finding the answer to life, the universe and everything, what we really need to figure out now is the question.